I was ecstatic. The oversized fit and grommet detailing make it the perfect piece to sport over leggings as seen here or even a maxi skirt. You'll definitely be seeing more of this item! Did you also catch those fun hot pink earbuds in the last pic? Bassbuds was kind enough to send me a pair from their newest collection. buds add a touch of sparkle to my daily routine! That necklace is awesome, I can't believe it's F21! love the camo pretty lady! 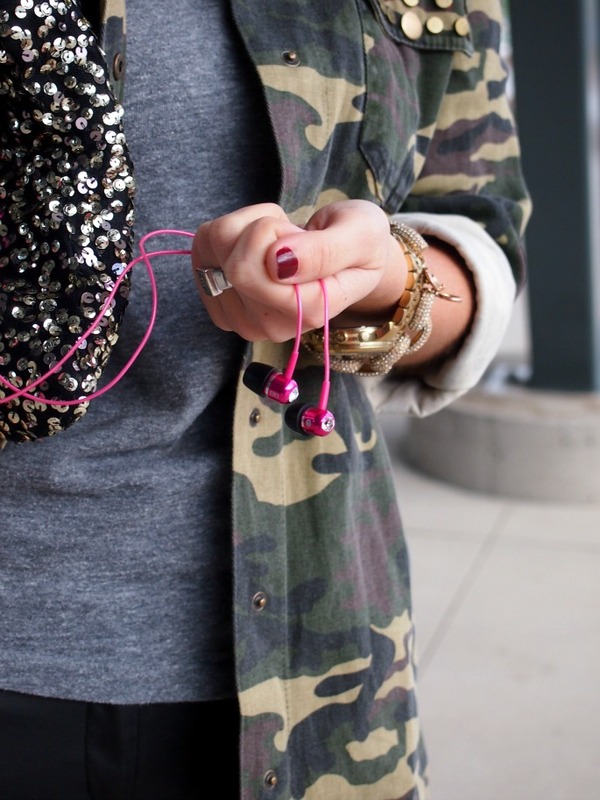 Love the camo with the cute pants! that jacket is amazing girl! i love it with those leggings too! I love everything about this look from head to toe! I've been obsessed with styling my faux leather pants from H&M lately and this is surely another great inspiration! I'm also loving the sequined clutch! You are totally rocking this look - love the mix of casual and chic pieces here...just the perfect balance! such a fabuluos look! loving your shoes! I love this outfit! I JUST got a camo jacket with a few stud details a couple days ago, so I'm stoked to see how you styled yours! This outfit is great! I just came across your blog and I am so happy I did! Always nice to find another Toronto based blogger. Im looking forward to following and seeing more! 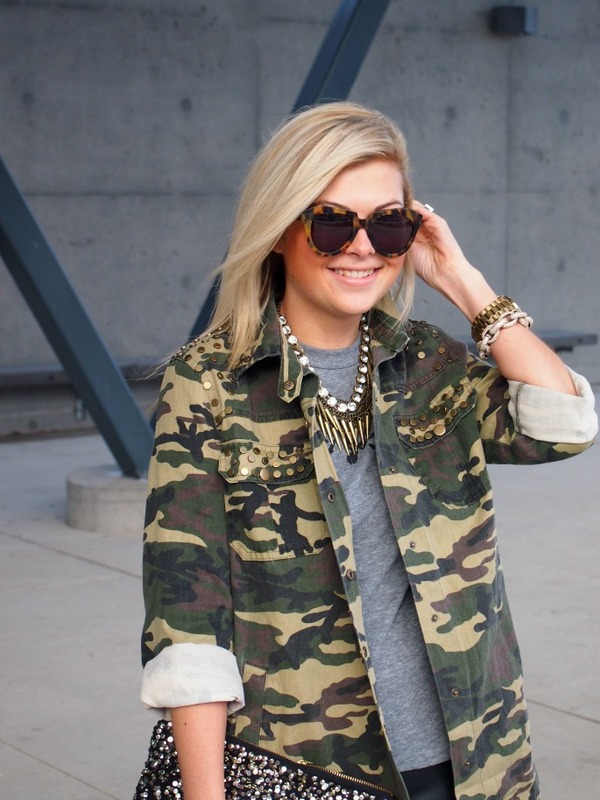 Camo + leather = Love it! Love your outfit!!! Loving your heels too! Hope you had a wonderful Christmas! Wow i love this outfit ! Love the lulu's jacket, they always have some great finds! One of my favorites from you - are those necklaces layered? Great look! That jacket is fab. Those pants are KILLLLLLER on you! They look so much more luxe than H&M! They fit you perfectly, and love them with the pumps & camo! Gorg, girl! Way to rock this look! I love the feel of edgy with glam! Camo is everywhere, it seems like people are going crazy for military style clothing, every single member of my family has camo jackets and they love to wear them.